In just three years time the London Olympics will be opened. The winning of the 30th Olympiad is probably the best thing that has happened to this country in at least the last decade. Whilst the cost is prodigious work is continuing at a pace. Think of East London, and the country, without the Olympics. No target, no future, no hope. Nothing to brighten us up. Yes it is costing a great deal but the guess is that if the money had been diverted elsewhere it would have either been frittered away or the project/scheme abandoned as a cost saving. London 2012 cannot be cancelled. Winning the Olympics can be paralleled with Maggie Thatcher’s decision to develop the crumbling London docklands with the LDDC. The LDDC has an awe inspiring legacy. Hopefully the same will be for the Olympics. Last week an important part of the transport infrastructure was completed with the inaugural (VIP) passenger run from St Pancras to Stratford International, the station at the heart of the Olympic complex. The extremely comfortable air conditioned 140mph Javelin train took just 6min 15sec for the journey. At its peak during the Olympic athletic events up to 12 trains per hour will serve the route, each one carrying just over 1,000 passengers. Even before this official preview of the service travellers from Dover have been able to take advantage of a Javelin shadow operation now working and being well received by travellers from the south east. A full service will begin in December. For some it has been something of a culture shock, actually crossing (under) the Thames to reach central London, their previous goal Waterloo, a world away. The scheduled train journey time from Dover Priory is likely to be 1hr 7min via the two Folkestone stations, Ashford and Ebbsfleet. Currently there is a single train in the morning from Dover to Waterloo taking a shade under two hours, the normal twice hourly service longer. Stations from Canterbury East to Margate will also be served direct from St Pancras. 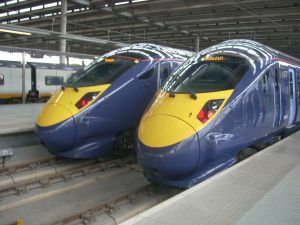 Stratford International has been designed as a dual purpose operation capable of taking both domestic services and Eurostar trains non-stop from the continent. Full passport and immigration and customs controls are being built in along the lines of the existing Ebbsfleet operation. Stratford to Gar du Nord in the heart of Paris could be as little as 2hr 5min, Brussels 1hr 45min. Amsterdam is expected to be linked to Eurostar by 2012. Also built into the plan, and nearing completion with the track already laid, is a DLR operation which will run from the new Woolwich Arsenal station south of the river, past London City Airport (LCY), through Canning Town and Stratford Regional to the heart of the Olympic complex. July 2010 is the target date for the introduction of services using three-car equipment. London City to Stratford International will be just 15 minutes. The same journey by road from LCY is a difficult four miles of single carriageway through some of London’s most deprived areas. Much improved, and with new trains arriving all the time, is the London Overground service from Stratford Regional through Hackney and connecting up with both the Victoria Line and First Capital Connect at Highbury & Islington and on to Richmond. ODA (The Olympic Delivery Authority and not to be confused with LOCOG – London 2012 Organising Committee, responsible for actually putting on the games – they both share the same offices), responsible for the facilities, says that construction work is on time and on budget. 250,000 people have already registered their interest with LOCOG to be a 2012 volunteer. Over 6,000 schools and colleges have signed up for Get Set, the London 2012 education programme. Early details of London 2012 ticketing strategy will be released in 2010, ahead of actual sales in 2011. Viewing of the Olympic Park, except for the privileged few (which does include local schoolchildren), is not easy at this stage, the construction having priority . By car it is possible to take the A12 south from its junction with the A406 – M11 extension and find a safe parking spot on what is high ground to the north of the site. At all times there is building work and scaffolding going up, and being taken down, and therefore it is not possible to note a specific watching point. By foot take the DLR to Pudding Mill Lane and walk along the Greenway. You will get a good perspective of the site. An alternative is Strafford Regional where the views are not so good but you can appreciate the whole magnitude of the operation. A local map is essential if you decide on this track. The ODA will be opening up the Olympic Park to the public on the London Open House weekend 19-20 September. There will be free, organised bus tours and an exhibition featuring models of the venues and the opportunity to hear first-hand from people working on the project. Check the London 2012 website after 1 August for more details.